Rise early. Put on your walking shoes or hiking boots. Prepare to be amazed! 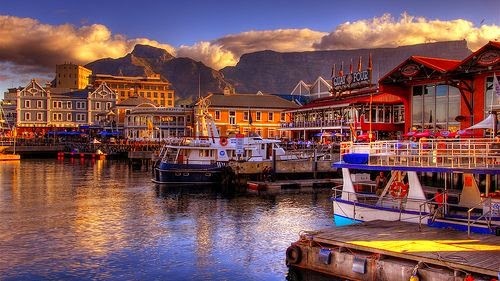 Just outside of Cape Town, looming large and inviting, is the crowning jewel of an amazing South African national park, Table Mountain. 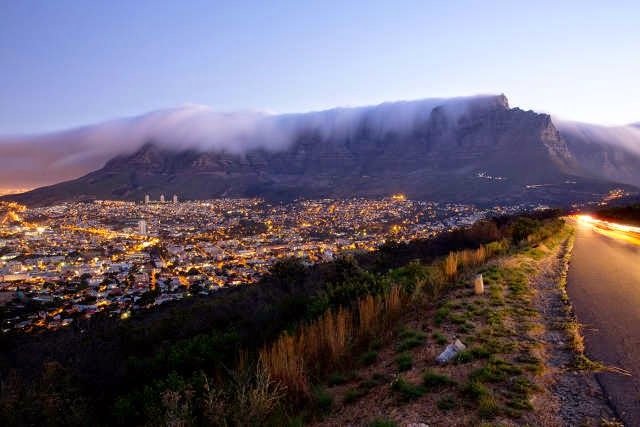 The park stretches roughly 60 km from Signal Hill around Cape Town then south to Cape Point, encompassing one of the most incredibly scenic mountain chains in the world. Fringed by beautiful valleys, forests, bays and beaches, it is a UNESCO World Heritage site. South Africa has the rare claim of eight World Heritage sites, each an area of extraordinary beauty and importance. 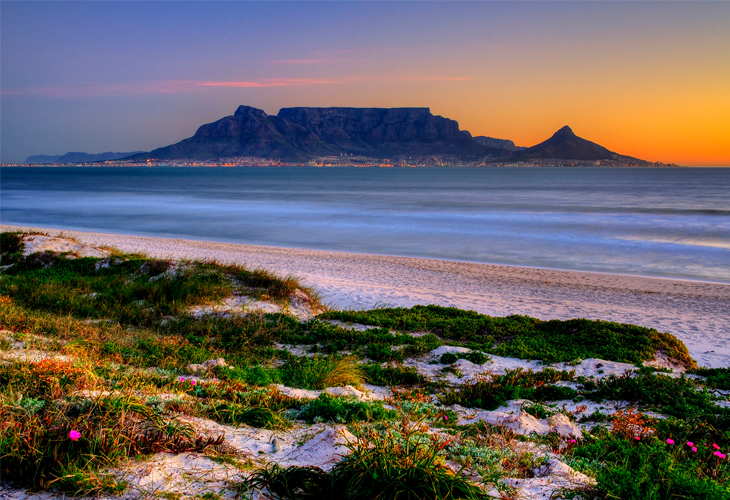 Table Mountain is also listed on the New 7 Wonders of Nature (a 2001 global pick initiative). Table Mountain is South African's precious jewel among jewels. 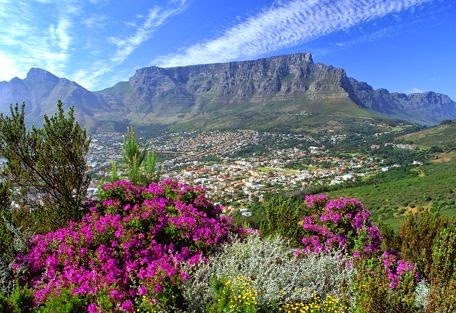 Recognized for its rich, diverse flora, it forms a partial border for the thriving, cosmopolitan city of Cape Town. Table Mountain National Park is actually divided into three separate sections. 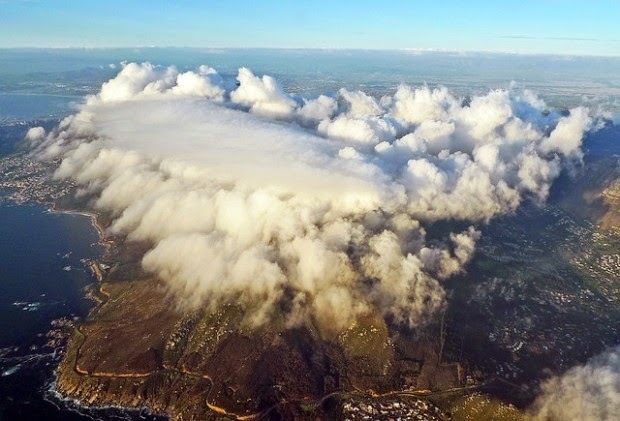 The Table Mountain section includes Signal Hill, Lion's Head, Table Mountain, Devil's Peak, the Twelve Apostles (actually 17 peaks), and Orange Kloof. There are a number of hiking trails accessible from Cape Town for exploration. If you are super fit, you can walk up Table Mountain in roughly three hours. Thankfully, the Table Mountain Cableway carries visitors from the Lower Cable Station to the top, allowing visitors to avoid the arduous walk up and offering spectacular views along the way. "70% of its floral species here occur nowhere else in the world." Rich in floral biodiversity the park is part of the Cape Floral Kingdom World Heritage Site, said to be one of the most diverse floral areas in the world. Fynbos, an ancient type of vegetation developed over millions of years, is the most abundant plant which produces magnificent flowers in spring (September/October). Although larger predators and large herbivores disappeared from the park at the hands of the European settlers long ago, smaller mammals are still found in the park and some large herbivores are being re-introduced. Sadly, the animals are gone, but the parks spectacular beauty and amazing views make up for the lack of wildlife. You may even get to walk among the clouds.